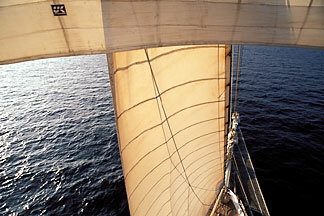 The huge white squaresails billow with wind from a clear and cloudless sky. Lanyards hale and strain against the sturdy steel of the four masts as we speed forward across the turquoise waters of the Andaman Sea. The wooden deck rolls gently with the waves and the breeze fills our spirits too. It is the morning after leaving Phuket on the clipper ship SPV Star Flyer and we are finally under sail. What a contrast to the past few days. The island of Phuket, now behind us 175 km to the south, is known as a place to get away from the busyness of Bangkok, but it is still a resort destination with its own stresses. After visiting several ornate gold bedecked Buddhist temples, a lush forest park with trails leading to a waterfall, the old town’s Sino-Portuguese colonial buildings from the turn of the century and the nightlife of Patong Beach I was ready for a rest. Last night at dockside when we boarded our four masted sailing ship in a light rain, lights strung in the rigging from bow to stern illuminated her with a triangular canopy. Haunting music echoed across the water. Some time after midnight we had slipped out to sea under engine power, leaving behind the holidaymakers. 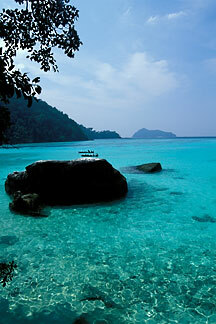 Now we were headed for the offshore islands and south towards the Malacca Straits. 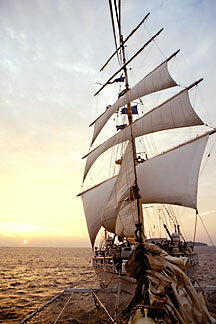 Another museum ship, the Pommern, captured the childhood imagination of a Swedish yachtsman Mikael Krafft. After a successful career in shipping, Krafft commissioned two identical vessels, 360 feet long, to be built in the Ghent shipyards in Belgium. Combining historical designs and modern shipbuilding techniques, the new ships, the Star Flyer and the Star Clipper were launched in 1991. 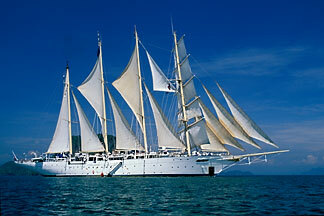 They now cruise the Caribbean, Mediterranean, Aegean and Andaman Seas carrying up to 170 passengers and a crew of 72. The reverie ended and within an hour I was back on the boat, refreshed. That night as we set sail for the Similan Islands, the sun set a peaceful magenta over the rolling waves. 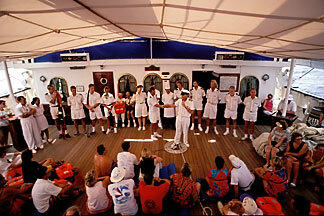 One of the passengers, a Canadian from Saskatchewan, had sailed from Cairo on the long Indian Ocean crossing. ‘I love the open sea and sky,’ he said. ‘It reminds me of the prairie, but without the snow.’ The quiet of the sails and the vast spaces were inviting indeed, but I wondered about days with only the endless sea. 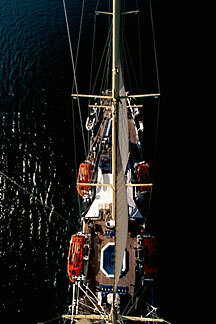 Sailing into Phang Nga Bay, on the eastern side of Phuket Island, I arranged to be lifted to the top of the main mast to photograph from the bosun’s chair, a small canvas seat used by the crew for repairs and observations. A hundred and fifty feet off the deck I felt suspended between heaven and earth. 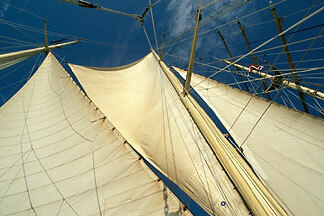 Only the rigging and the gentle sway of the mast kept me grounded. Ahead of me lay dozens of tall green-clad limestone outcroppings, some of the 120 peculiarly shaped islands of Phang-Nga National Park. Some have caves, natural bridges and arches, others sheer vertical walls, even overhanging, which rise straight out of the water to up to 270 meters height. Sea kayaking tours explore some of the more interesting rocks as well as small fishing villages. Some time that night we crossed into Malaysia waters and we spent the next day exploring the northern island of Langkawi. It was the 315 nautical mile sail down the coast to Malacca, though, that most intrigued me. This was the ancient trading route along which spices traveled from Sumatra and Java to India and China and beyond. Through these waters sailed junks from China, Arabian dhows, Sumatran schooners and ships from south India and beyond. Later came the Portuguese galleons and gun-laden British and Dutch East Indiamen the colonials used to wrest the valuable spice trade from the Malaysian sultans. What was it like for these seafarers, without modern amenities or navigation equipment, out in the open sea? They too were headed for Malacca. First settled in the late 1300’s by Parameswara, a Sumatran prince, Malacca (or now Melaka) grew to be the largest city on the Malaysian peninsula. The old town still has an air of exotic trade. Chinese houses of wealthy merchants line Jelan Hang Jebat, the main street of Chinatown. Some have been converted to museums, and a few are restaurants serving the distinctive Nyonya, or Straits Chinese, cuisine. Many cultures have contributed to Melaka’s mix. In one afternoon I visited a Chinese temple where a family mourned their grandfather, a tiled mosque on the same street where the imam sat cross-legged on the marble quietly reading the Koran, and the red-clad Dutch built Christ Church whose gardens look out over the main square. For all the fascination of the port visits, though, once back on board the Star Flyer, with the wind in the sails and the taste of salt in the air, I found the wide vistas of water strangely soothing. Perhaps, I thought, this is what has attracted mariners throughout the ages. I found this most enticing. 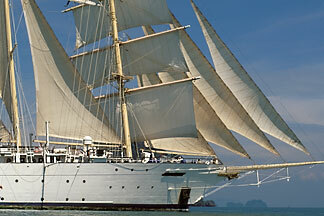 I am taking wife and son Daniel (15) on this ship at New year 2010. I wish more of my family were with me. I just know it is going to be very very special. What a wonderful account you give – rich and more than interesting. Wish I was cruising for a month.